With good humor, stories, and true experiences, the author takes you on an adventure. This adventure will explore your family's past through the original records kept by your relatives as they arrived, set up a home on a piece of land, paid taxes to protect it, went to court to defend it, and often died to preserve it for their loved ones. Along the way, you'll enjoy stories written about your ancestors by their friends and associates who included them in their journals, histories, and newspaper articles. 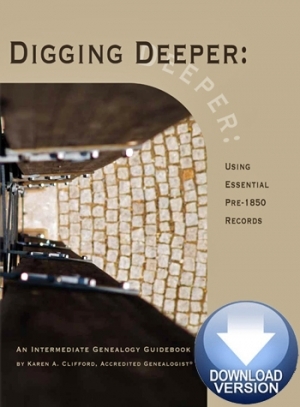 Digging Deeper is more than a reference book for genealogists, family historians, and reference librarians. It is an instruction manual for any family historian. Using Internet and computerized databases as a jumping-off point, you can find jewels of evidence in other less-commonly used records--those valued for the secrets they reveal about long-forgotten families. And combine information from the above records with insights gleaned from historical documents. Click here to preview the Table of Contents, the complete index, and a few selections from the book (41 pages). Karen Clifford develops and teaches multiple online genealogy courses at colleges in California and Utah. She is an Accredited Genealogist� Professional and a Fellow of the Utah Genealogical Association. She has been President/CEO of Genealogy Research Associates, Incorporated since 1997. Her years of professional research work lead to authoring college textbooks and do-it-yourself guidebooks covering both traditional and electronic genealogy research including several books: Becoming an Accredited Genealogist, The Complete Beginners Guide to Genealogy, the Internet, and Your Genealogy Computer Program (updated 2011), and Digging Deeper: Using Essential Pre-1850 Records (2011). She was the founding President of the Monterey County Genealogy Society, a Director of the Monterey California Family History Center, President of the Utah Genealogical Association, a Vice President of the Federation of Genealogical Societies, and a Vice Chair of the International Commission for the Accreditation of Professional Genealogist (ICAPGen) where she continues to oversee Test Development and Test Quality Control.